Louis K. Meisel Gallery is pleased to announce Ebb and Flow, the first solo exhibition for Ariel DeAndrea in New York. 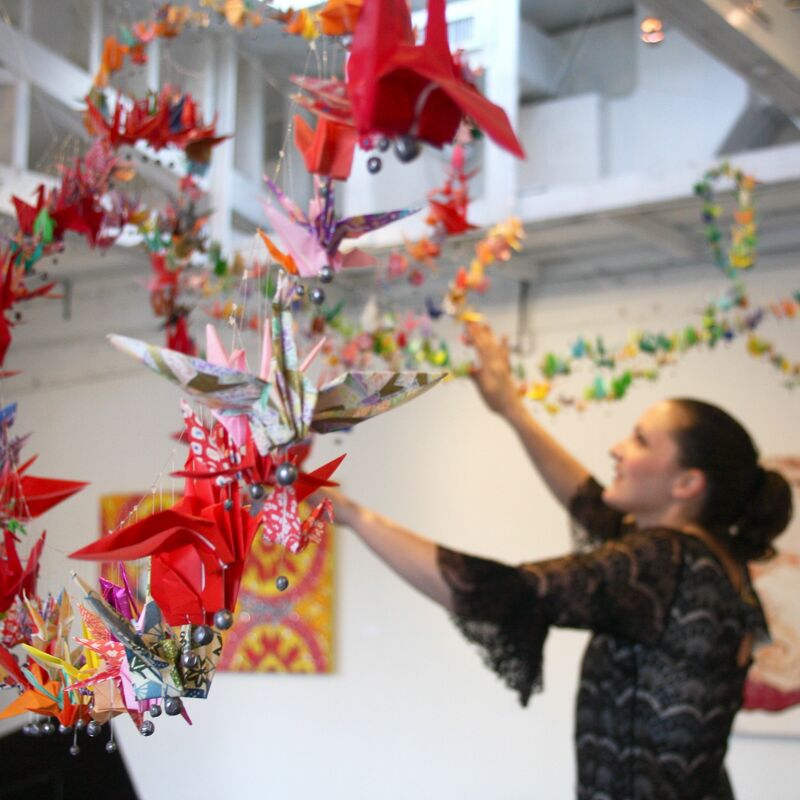 An up-and-coming West Coast artist, DeAndrea’s mixed media works feature origami cranes in natural environments as her primary subject. Influenced by Japanese mythology, her realist paintings and installations transform the inanimate into the living. Verging on the surreal, DeAndrea’s compositions teem with life. Colorful, winding brushwork emulates the sensation of bubbling water, buoying solitary paper cranes which drift across the water’s surface. Always dynamic, DeAndrea’s cranes ably navigate a variety of environments, facing tumultuous waves and placid waters alike. Ever-fragile, the cranes are highly decorated for their journey with saturated organic patterns. Their individualization is defined not only by their outward appearance, but also by their movements. Captivated, and at times, consumed by the water’s currents, each crane seemingly personifies different states of being. Ariel DeAndrea: Ebb and Flow is on display from June 14th to July 20th. An opening reception will be held on Thursday, June 14th from 6 to 8pm. For more information, please contact Louis K. Meisel Gallery at gallery@meisels.com. Ariel DeAndrea will explore the movement and life in the design and symbolism of an otherwise lifeless object: the origami. She will present a new series of oil paintings featuring origami cranes in natural settings: bodies of water from around the world. In these paintings, the paper bird comes to life in its animated travels on the surface of the water, riding along the current or the wave, drawing focus on the life and beauty of a single crane, allowing the origami crane to become much more than a folded piece of paper. The cranes’ communion with nature in these pieces speaks to both Japanese cultural practice, spirituality in Shinto and the unique reinterpretation of the artist to reflect her personal spirituality. Thinkspace Gallery (Los Angeles) -is pleased to present new works by Ariel DeAndrea in Dreams Of Flight. An accomplished painter and installation artist, DeAndrea’s works are expressive dreamscapes developed through a personal iconography. Her paintings combine technical elements of hyperrealism with a surrealistic stylization that is distinctly her own. Looking to the crane as a symbol of hope and salvation, the artist creates hyper real paintings of these delicate origami birds. The imagery is at once intensely poetic and strategically understated. Often staged in atmospherically shifting water, the paper talismans are refracted through light and subtle reflection. A shimmering blur of organic patterns and prismatic shifts, the serene paintings are quietly exquisite in their detail and execution. The sense of meditative calm conveyed by the work, contributes to its measured and deliberate impression of the surreal. The images are hauntingly poignant as a result; like silent suspended excerpts from a revelatory dream. As a recurring symbol for the artist, the crane is frequently shown with figurative subjects or self-portraits, and is staged alongside the crocodile as its repeated symbolic counterpart for fear and atrophy. Drawing from the proverbial divisions of good and bad, and light and dark binaries essential to the symbolic function of fable the artist uses her work to polarize experiences of hope and fearfulness, salvation and damnation, bringing deeply emotive subject matter to life. Intensely personal, the works are like psychological portraits of human conflict. Looking to the uncomfortable proximity of hope and phobia, and our constant negotiation of their coexistence, DeAndrea’s works are powerfully simple and stirring. Like the indelible visuals left by dreams, the imagery in her work is intimate, surreal, and beautifully vulnerable.